The nearest Starbucks to my office has closed very suddenly for 'refurbishment' after Starbucks was fined £12,000 due to a persistent infestation of mice. Despite 21 visits from Rentokil, environmental health officers found evidence of mice essentially everywhere. Although I do have some sympathy with anyone who's trying to get rid of the little blighters, I tend to think that if you pay a week's salary for a coffee it should essentially be rodent-free. 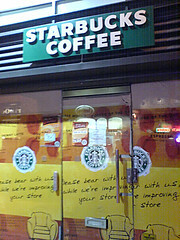 This is also the Starbucks that the Tony and Gordon show visited a couple of years ago. I'll have a mouse and eggnog latte please. yuck! Yuck!! and say again, YUCK! Cinnamon or cocoa on your mouse?